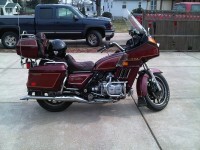 I have a 1984 GL1200i bike with 24k on the speedometer. When I squeeze the brake lever on the right end of the handlebar, which works the left brake rotor on the front wheel, I get a strong pulse as if the rotor was warped. I have cleaned the caliper twice and retorqued all the wheel and caliper and rotor bolts and had the rotor turned very slightly by a clutch place nearby that has been in business for 40 years and turns a fair amount of stainless steel clutch plates for foreign sports cars. I jacked up the front wheel and eyeballed the front rotor as it spinned and cannot find the slightest warp or damage to the rotor. I rebuilt the master cylinder connected to the right brake lever. I can't get rid of the pulse. The local Honda dealer mechanic said it could be a rotor that is too thin. I took my digital caliper and checked the thickness of the rotor. The rotor is 4.65mm thick and the lowest the manual says normal thickness is 4.5 to 5.3mm and the lowest thickknes allowed is 4.0mm. Even when I touch the brake lever with my little finger I get a strong pulse in the brake handle so it can't be that the rotor is heating up. I'm thinking of swapping the left and right rotors on the front wheel and buying new brakes. Anybody got any ideas what is causing the pules in my brake handle? The pulsing is strong in the brake lever and the front end bobs up and down when stopping, but only when I use the front brake lever. There is no pusling using the brake pedal. I checked the runout on the rotor with a dial indicator and could not see any runout al all but I couldn't check the back of the rotor. But I heard a slighe scraping in a certail area on the rotor as it passed the brake pads so I assumed the back of the rotor had a problem. I had the rotor turned again at the clutch machine shop but it didn't make any difference. I suspect since the rotor is concave it does not do well on the clutch grinding machine. The machine shop routinely turns Porsche stainless pressure plates and giant 18-wheeler rotors but they are all flat. Since I have put a kit in the master cylinder, and cleaned the inside and outside of the calipers, and bled the thing several times, and checked the runout with a dial guage, and checked the thickness with a digital micrometer, I will now try new brake pads and if that doesn't do it I will be in the market for an almost new right brake rotor, or sell the bike as is. I can't see spending $200+ for a brake rotor. Anybod got a rotor they will guarantee? Can the rotors be swapped left/right to just test the bad rotor idea? I agree that the rotor has gone banannas and needs to be replaced. I've tried everything else I can think of, twice. And no the rotors can't be swwapped left to right. They are marked left and right and the grooves in the rotor would be backwards if I swapped. 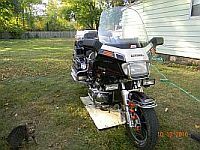 I'm still looking for a used rotor that someone has on their GL1200 that has been in the garage for 20 years and will not start - I love those kind of bikes. You say the front end is going up and down during braking, as if the amount of braking is changing with the wheel rotation. You might want to get a can of brake cleaner and hose down your entire brake system - rotors, calipers, pads, everything. You might have some contaminant on the rotor (i.e. oil, brake fluid) that causes it to "slip" through the brake pads easier when that part of the rotor moves through the caliper. I blasted the rotor and brakes shoes more than once with brake cleaner and sanded the brake shoes. I'm in the marked for a usde 84 GL1200i left front brake rotor. My 84 I pulsing too, but I have to pull fairly hard on the handle. My front end dosne't bounce thoe. Everything looks good on mine as well so I have just learned to live with it. Your front and left rotors should be able to be swaped side to side. Try this first. Lossen the caliper mount a little. Spin the wheel as fast as you can and have some one apply the brake. Watch the caliper and see if it bounces. If it does, then you know the rotor is warped. I have worked in brake and muffler shopes for 7 + years and I can tell you that turning these rotors are very hard to set up because the way they mount to the wheel. The only true way to turn the rotor is to turn it while it is still mounted to the wheel! I have turned all types of rotors, drums and flywheels, but these rotors take the cake. I used a clutch shop that has been around for 40 years and turns clutches for Porsches and 18-wheelers to make sure the rotors aren't warped. I don't know of anyone who will turn a stainless steel rotor like you would turn an automobile brake rotor. I am going to check both rotors one more time and then just live with pulsing and hopping. This might seem off the wall, Did You check the frt. wheel bearings? Many moons ago I had a bike that had a problem like that, It turned out to be a worn bearing on one side, Upon braking the whole wheel would move throwing everything off slightly giving it a pulsating shutter. When up on a jack it spun true but when riding and brake force was applied it would show up. The goofy brake lever problem continues. I had both front brake rotors turned at a local clutch shop and rebuilt the master cylinder on the handlebar and then , , , , I swapped left and right front brake rotors . . and . . the brake lever still pulses. And you would swear I have a bent rotor but I don't. Can it be I have a goofy caliper on the left front brake or goofy front brake pads on the left caliper? 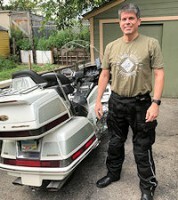 I took my left caliper to my favorite old Goldwing guru and he examined it and cleaned it and found nothing seriously wrong. 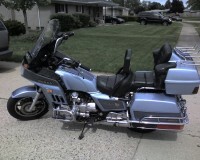 I put the caliper back on the bike and the pulsing continues. I took my dial indicator and pushed it against the tire and rotor while I used my Ryobi drill chuck to make to tire rotate. Although the tire seems to be a little of round the rim doesn't. I couldn't find any warpage in the wheel rim or the calipers. Maybe tomorrow I'll adjust the bolts that hold the rotors to the wheel so that they are a hair looser just to see if that makes any changes. The bike only has 24k on it so I haven't checked the bearings but I guess I should. Any luck with this? I am having a similar problem on my 83 GL1100A. Just an idea, but you might want to check your steering bearings free play and tightness. Do you have a fork brace? There's also a remote chance of a bent axle,bad wheelbearing or "tweaked" alignment.The forks not being parallel. Dont forget the tire too.If it's out of round or mounted poorly,during a heavy decelleration the bike will put a lot of downward force on the front end.It needs to be stable(head bearings,fork slides,etc)for it to track smooth. I really haven't started looking in to mine yet. Just trying to figure out other things to check before I start dropping money on things. One thing I did notice is when I was riding it last season, if I was on my brakes firmly and release it quickly something clunked. Everything with the brake assembly is/was tight when I checked it. It was hard to tell if it was coming from the front end or from something in the master cylinder sticking. I haven't been able to check it in the garage, and extra set of hands to help with tests that require two people has been hard to come by lately. I never really found the problem after many days of trying anything. I finally sold the bike, with a new used rotor, to someone who really wanted it. Thanks to everyone who replied to this post. thomascomcast wrote: I never really found the problem after many days of trying anything. I finally sold the bike, with a new used rotor, to someone who really wanted it. Thanks to everyone who replied to this post. Sad to hear you gave up on the bike. I was going to suggest 'borrowing'/swapping brake rotors with someone to see if the problem followed the rotors. If the problem remained then I would suggest swapping out the calipers and mounting hardware. Maybe this might help out others who are following the post.